To apply for a library clerk position, the applicant must provide a completed HPLD Application, resume, and cover letter. The application may be printed from the link below or you may stop in for a physical copy. Once completed, the application can be returned by email, regular mail, or hand delivery. The resume and cover letter must be returned by email. Any questions may be directed by email to questions@heyworthlibrary.com. 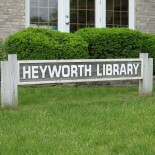 The Heyworth Public Library is always accepting applications. We are an Equal Opportunity Employer.